To inquire about listing your congregation's worship information, please e-mail us at ldn@lincolndailynews.com or call us at 217-732-7443. 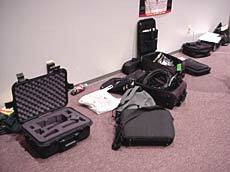 [AUG. 10, 2002] R49 is a mass of organized confusion as a dozen students scour the room for lost computer cords, guitar picks and group partners. Lincoln Christian College students know R49, located in Restoration Hall, as the IDS (interdisciplinary studies) room, and it usually inspires the most interesting mixture of boredom and panic. But while both emotions exist in the room at this moment, they are by no means the prevailing atmosphere. Tonight, no grades hang in the balance, no scholarships, no degrees. Tonight, Friday, Aug. 9, high school students from across the Midwest simply wait in prepared anticipation for what will be the culmination of their week. These students, who come from towns as far as Boise, Idaho, and as close as Lincoln itself, are participants in Lincoln Christian Seminary’s WorldviewEyes Summer Seminar. There were four seminars this summer in cities around the country, in addition to presentations at all 22 Christ in Youth conferences and 10 CIY Discipleship winter youth retreats. WorldviewEyes began with a grant from the Lilly Endowment, which sponsors programs that advance Christian education. The grant was obtained through the efforts of LCCS professor Dr. Richard Knopp. 2002 marks the third of three years given for the original $525,000 grant. The grant has recently been renewed for another three years at $262,000. At this seminar, students came to the LCCS campus to spend the week studying “Christian Faith, Competing Worldviews, and Contemporary Culture,” with each day focusing on a different topic within that overall theme. The seminar started Sunday afternoon with the topic, “Who Am I? Who Are You?” Students spent the evening learning about each other and how they could work together effectively. Tuesday, they moved on to other worldviews, including deism, secular humanism, pantheism and New Age. In the evening, students participated in a discussion on the upcoming WorldviewEyes curriculum. A team is working on this curriculum for Christian youth groups, campus ministries and home schools. It will include resources for all levels of technology, from workbooks to videos to PowerPoint slide presentations. Lessons will be similar to those learned at this and other WorldviewEyes seminars. Wednesday, students learned about “Applying the Christian Worldview.” They learned how worldviews are found in contemporary society and how they can relate their Christian worldview to aspects of society, such as music and movies. They also prepared for their application field trip. Students took their field trip Thursday to Chicago. There they studied “Worldviews and the City” by approaching people on the street and asking questions about their worldviews. 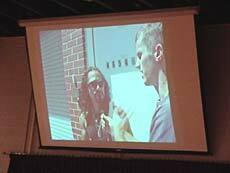 Students worked in teams, with one person performing the interview and another videotaping it. Some of the questions students asked were: “Do you believe in God?”; “What happens after we die?”; “Where did all this [the universe] come from?”; “Are there miracles?” Students interviewed people both on the north side of Chicago and downtown on Michigan Avenue. Friday was dedicated to preparation of their evening presentations. 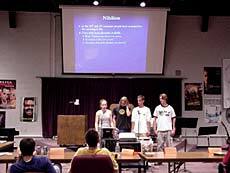 This “Worldview Reflection” consisted of research both in the library and on the internet, technological preparation (such as video editing and PowerPoint slide show presentations), and organization of all materials. And that brings us back to Friday evening in R49. After some minor technical difficulties, students finally are able to present their group projects on different worldviews, including nihilism and New Age. It was ironically appropriate that Lincoln Daily News was present at this event, as the program is highly technological, drawing on websites, videos and music. In addition to their studies, students learned to use laptop computers, digital and video cameras, and video editing equipment. By the time this posts, most students will have left for home, returning to their lives and their worldviews, but hopefully with a better understanding of the people around them. [AUG. 10, 2002] At the annual Vacation Bible School, Jefferson Street Christian Church will take kids on a "Bug Safari" this year to learn about God’s love. The Bug Safari program will provide fun, memorable Bible-learning activities. Each night kids will sing catchy songs, play teamwork-building games, nibble tasty treats from Picnic Place, experience electrifying Bible adventures and create Bible Point crafts they can take home to remember what they’ve learned about God. Says director Cathy Thorson, "This is a hands-on, activity-based VBS with games, lessons, videos, crafts, fun songs with actions, and snacks that all focus on a particular bug of the day and what they can teach us about God’s love and biblical truths." Children entering kindergarten through sixth grade are invited to be "explorers" and attend VBS every night Aug. 11-15. The program will start at 6 p.m. and meet until 8:15. Parents are invited to join the Firefly Finale at 7:55 to experience the fun and excitement, and to enjoy an entertaining experiment that will also emphasize the Bible point of the day. The children are encouraged to bring offerings of money and school supplies, which will be donated to the children of Haiti through missionary Mioche Rock. "We have set three offering goals this year. If the children earn $500, a station leader will get a pie in the face on Thursday; at $700, the Sing, Blast and Play station leader will do something crazy and wild to her hair color; at $1,000, we have a wet and wild surprise for the kids and parents following the snack and Firefly Finale on Thursday (approximately 8:30)," says Cathy Thorson. JSCC is located at 1700 N. Jefferson St. in Lincoln. For more information, contact Brenda Smith, 735-1359; Cathy Thorson, 732-1146; or Laura Moore, 732-9294.